DFT check valves undergo rigorous shell and seat closure pressure tests to ensure they meet industry quality requirements. Our infographic illustrates the types of tests we perform and the standards to which our valves our held. 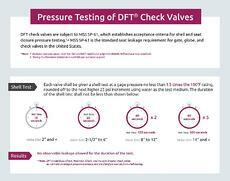 The infographic demonstrates the different testing stages DFT check valves are put through, including the shell test, seat test, seat test with water, and seat test with air. Fill out the form to download the complete infographic.